Jonathan and Wynter Pitts invite you on a journey to explore a different approach to your happily-ever-after marriage. Emptied is a way of life. It's not about trying harder; it's about thinking differently. Only when you are emptied of your own self-focused motivations can God pour new life into you for the abundant marriage and satisfying relationship you long for. Are you ready to approach your marriage poured out, ready to be filled up? Maybe you entered marriage with some pretty high expectationsmost couples do. Jonathan and Wynter Pitts did. Until the reality of married life spilled into their expectations. Emptied is a way of life. Its not about trying harder, its about thinking differently. Only when you are emptied of your own self-focused motivations can God pour new life into you for the abundant marriage and satisfying relationship you long for. 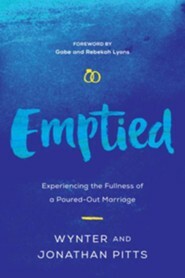 Are you ready to approach your marriage poured out, ready to be filled up? Wynter Pitts is the author of several books, including Youre Gods Girl! She is the founder of For Girls Like You, a bimonthly magazine that equips girls to walk boldly into who God has created them to be and to resource their parents to raise strong Christ-following God girls who say yes to His plans for their lives. Wynter tragically passed from death to life on July 24, 2018, after 15 years of marriage to her beloved Jonathan. She leaves behind an incredible legacy through her many writings but more importantly in her four daughtersAlena, Kaitlyn, Camryn, and Olivia. Jonathan Pitts is an author, speaker, and executive pastor at Church of the City in Franklin, TN. Prior to pastoring, Jonathan was executive director at The Urban Alternative, the national ministry of Dr. Tony Evans in Dallas, Texas. Jonathan lives in Franklin, Tennessee with his four daughters. Wynter Pitts is the author of several books, including You're God's Girl! She is the founder of For Girls Like You, a bimonthly magazine that equips girls to walk boldly into who God has created them to be and to resource their parents to raise strong Christ-following God girls who say yes to His plans for their lives. Wynter tragically passed from death to life on July 24, 2018, after 15 years of marriage to her beloved Jonathan. She leaves behind an incredible legacy through her many writings but more importantly in her four daughters - Alena, Kaitlyn, Camryn, and Olivia. 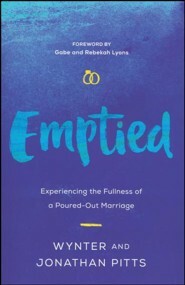 I'm the author/artist and I want to review Emptied: Experiencing the Fullness of a Poured-Out Marriage.